Steven (Chicagoland, United States) on 25 October 2017 in Landscape & Rural and Portfolio. The Niagara Whirlpool is a natural whirlpool along the Niagara River located along the Canada–U.S. border between New York and Ontario. 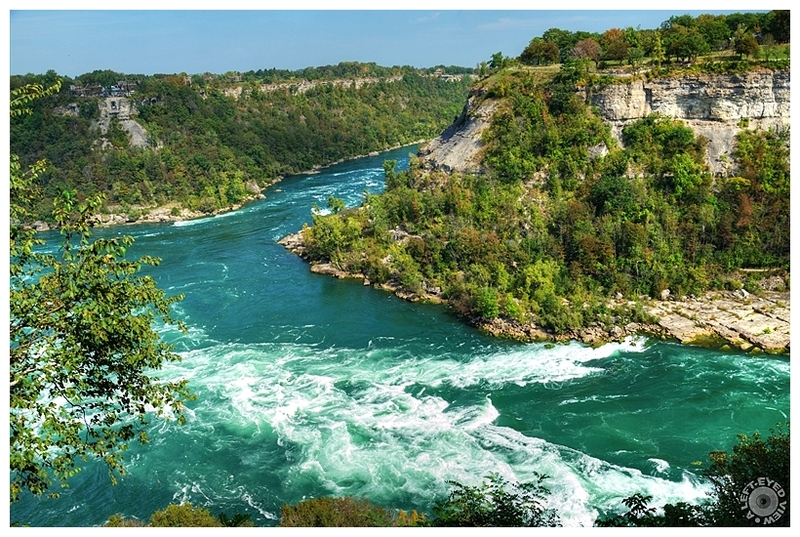 The whirlpool is located in the Niagara Gorge, downstream from Niagara Falls. The whirlpool's greatest depth is 125 feet. It is estimated that the whirlpool formed approximately 4,200 years ago by the upstream erosion of the Niagara Escarpment by the Niagara River. Niagara Falls is located along the boundary of the Niagara Escarpment and has been "retreating" upstream since its formation. During this normally slow process, the retreating falls intersected with an ancient pre-glacial river bed inside Saint David's Buried Gorge. During the retreat of ice from the Wisconsinan glaciation of the last glacial period, the gorge was filled with loose sediment and rock. When the falls intersected with this buried gorge, the river quickly washed away the filled-in silt and rocks. The ancient buried gorge was nearly perpendicular to the Niagara River. This sharp and sudden change in direction of water flow, coupled with the rapid flow of water exiting the Niagara Gorge (speeds as high as 30 feet per second), resulted in turbulent swirling of the river. Further erosion of the harder rock has resulted in a rounded basin that extends just to the side of the actual river's course. The whirlpool naturally spins in a counterclockwise motion during normal flow. When more water from the river is diverted to the surrounding hydroelectric power plants, however, the flow often reverses. Photo captured September 25, 2017. Fine scenery. The description is interesting and opens the picture a lot more than a mere headache. Thank you for letting it so extensively. Wonderful landscape. Amazing color of water. Magnifique point de vue sur le tourbillon et les bords abrupts des gorges ! Wonderful view ! amazing ! Superbe contraste des couleurs ! Merci pour cette belle prise de vue ! YOur viewpoints for these images is stunning. Can't top that vantage point, and the image quality is superb. Great power here ! A magnificent picture ! A fine picture of the whirlpool. The way it was formed is very interesting. A beautiful image of the whirlpool and interesting information. That is another excellent image. It is amazing how this whirlpool was formed. Great information! I don't think that I would want to get stuck in it. A gorgeous image! In other words, nature creates spectacular locations and fantastic conditions.